Horses coming from around the world for the 2018 World Equestrian Games in Tryon, N.C., will either fly into Greenville-Spartanburg International Airport or Charlotte Douglas International Airport. “We’re actually about twelve months behind making the (transportation) decision,” said Jim Dutta of The Dutta Corporation. Dutta’s company specializes in transporting horses and has served clients in the Tryon area. The World Equestrian Games are scheduled Sept. 10-23, 2018 at the Tryon Equestrian International Center. Dutta said on-site visits to the airports are necessary and the decision will be made according to several factors including ease of transportation from the airports and the airports’ ability to hold the horses for a 3-day quarantine. “We will make the decision what is best for the client and horses,” Dutta said. Doug Smith, from Spartanburg, is a commissioner with the GSP Airport Commission. He said he is in favor of GSP making a pitch but it should be cost-effective. “The question is for us, what is our investment and what do we get out of it? Only three airports in the U.S. – Miami, New York and Los Angeles – are certified by the U.S. Department of Agriculture to accept international livestock into the country. “(GSP) would need to be certified by the USDA to accept (horses) from other countries,” Dr. Stephanie Cox, South Carolina State Veterinarian, said. GSP entered into a three-year marketing agreement with the Tryon Equestrian Center last year. One benefit, according to the announcement, would be for the equestrian center to promote GSP’s bid to host the international flights transporting the horses. GSP may also be a base for the affluent horse owners arriving from outside the country be either commercial or charter flights. Senator International flies two roundtrips from Munich, Germany to GSP each week delivering automobile parts for suppliers to BMW Manufacturing, among other companies. KUSA - From 2014 to 2015 - incidents of laser pointers hitting aircraft nearly doubled,which federal agencies say puts pilots and passengers in serious peril. 9Wants to Know examined the three cases that have been prosecuted in Denver and have found it’s common for those charged with this to avoid prison time. Paul Drexler, a photographer who records aerial video for 9NEWS in Sky9, recorded video of a laser striking the news chopper last November. After the initial surprise, the helicopter and Drexler’s camera began tracking the laser, and ultimately isolated two men standing in a parking lot. One was holding a laser pointer. “We got a shot of the license plates, which was fortunate because it was dark, and then Denver police came and apprehended him,” Drexler said. The investigation in this case is ongoing and federal charges are expected. .
Reported incidents of lasers hitting aircraft in the United States increased sharply, from an average of about 3,500 laser strikes every year between 2010 and 2014 to more than 7,000 incidents in 2015. Reports are not yet completed for 2016, but the Federal Aviation Administration data shows that in the first 11 months of 2016, pilots across the country reported 6,700 laser strikes. The 2015 data shows Denver has the eighth highest city for reporting laser strikes against planes and helicopters. The city with the highest reported number of strikes is Phoenix, where pilots reported 263 laser attacks in 2015. In 2012, President Obama signed an anti-laser measure into federal law, stating that any person caught willfully striking an aircraft with a laser pointer could face 5 years in federal prison. Since 2013, pilots have reported hundreds of laser incidents in Colorado. So far, three men have faced federal charges for their crimes. So far, two have avoided prison time and were sentenced to probation. The third has not yet been sentenced. The case against Eric Gow of Colorado Springs began in December 2015. 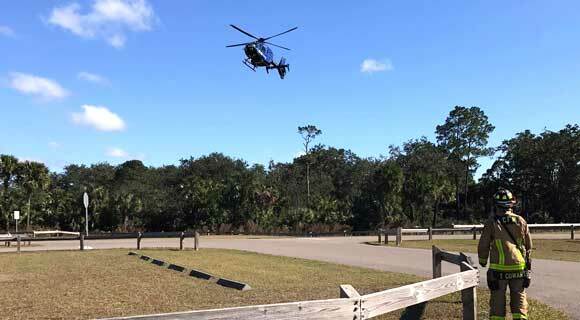 Two helicopter pilots reported, while conducting Christmas light tours, their chopper was struck by a laser pointer. On at least three separate occasions, their cockpit lit up with the diffused flash of a green laser. The pilots zeroed in on the approximate location from which the laser beam originated, and reported it to air traffic control. These reports launched a federal investigation. The FBI set up a camera in a residential neighborhood where Eric Gow lives with his mother and grandmother. On Jan. 14, 2016, the camera recorded Gow flashing a laser at a Delta Airlines flight, aiming at the passenger jet 4 separate times. Then, four nights later, the FBI surveillance footage showed Gow aiming his laser at a private aircraft. On Jan. 21, 2016 the camera recorded green flashes from a laser pointer shining out of Gow’s bedroom window, aimed at a SkyWest plane. 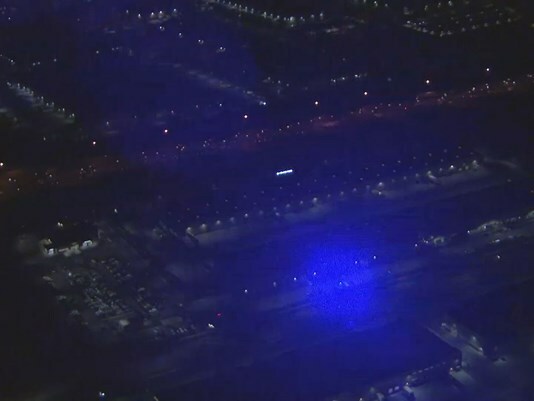 The pilot reported a laser incident at approximately 9:44 pm. The camera recorded flashes from Gow’s window three separate times, starting at 9:44 pm. By February, the FBI had a warrant to search Gow’s home, and Gow admitted to hitting aircrafts with a laser pointer. His sentencing hearing is scheduled for April. The other two men who have been convicted in Colorado were both caught shining lasers at the Denver Police helicopter. On March 18, 2015, the Denver police air support unit, Air-1, was conducting routine patrol when a green laser pointer struck the cockpit. The pilots changed direction to discover where the laser attack originated. The driver was identified as Saher Suleiman. Suleiman plead guilty to federal charges and was sentenced to one year of probation. He could not be reached for comment. Nathan Finneman, a sort of pilot himself, was also caught striking the police chopper with a laser in 2013. After pleading guilty, Finneman was sentenced to 6 months probation. Finneman did not respond to 9Wants to Know requests for comment. For pilots and investigators, the crime isn’t worth the risk or worth the punishment. 9Wants to Know did not find evidence of a crash due to a laser pointer, though many federal agents believe this is possible, and the data provided by the FAA does show numerous injuries associated with the laser incidents. In 2015 alone, more than 50 reported laser incidents resulted in an injury, most often related to temporary blindness of a pilot or crewmember. 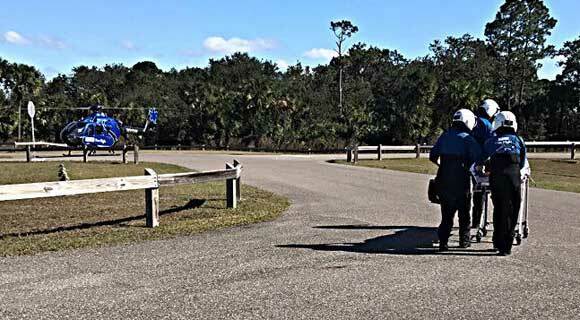 Brevard County Fire Rescue Engine and Rescue 29 transferred the victim of an ATV crash to Holmes Regional’s First Flight helicopter at Fay Lake Wilderness Park in Port St. John Sunday afternoon. 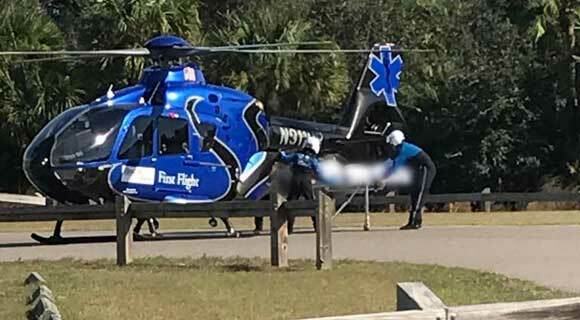 BREVARD COUNTY • PORT ST. JOHN, FLORIDA – Brevard County Fire Rescue Engine and Rescue 29 transferred the victim of an ATV crash to the Holmes Regional Medical Center First Flight helicopter at Fay Lake Wilderness Park in Port St. John on Sunday afternoon. The incident took place Sunday afternoon in Port St. John. The identity and condition of the victim has not been released by authorities. COLUMBUS (WSYX/WTTE) — Eric Delbert says interest in those wanting to get concealed-carry permits has been steady since the new year. As owner of L.E.P.D. Firearms and Range, he says that's only increased since Friday's deadly shooting at the Ft. Lauderdale airport that left five dead and eight wounded. He adds that Ohio Senate Bill 199 recently signed by Ohio Governor John Kasich is also peaking the interest of many. "You need to be aware of your surroundings and be prepared to battle back" Delbert said Saturday. 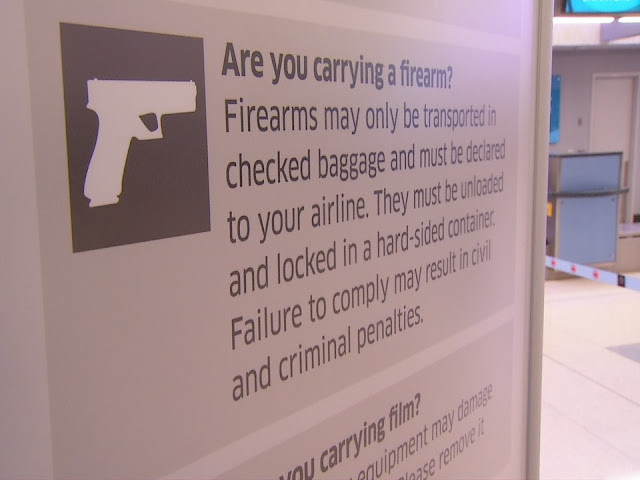 At John Glenn International Airport, travelers say while their thoughts and prayers go out to those affected by Friday's tragedy, they're mixed on the new Ohio law. Jamie McGinnis and her husband are getting their concealed-carry permits this year, and say the changes at the airports will give people more control over their safety. "I will get my concealed-carry and do all the necessary things and will not have any problems using it if someone threatens my family" McGinnis said. Others like Springfield native Susan Fuchs aren't so sure. "I think that people having guns would possibly lead to more panic" Susan said. ROCKFORD - The Chicago Rockford International Airport, 2 Airport Circle, will celebrate its first 2017 passenger service to Montego Bay, Jamaica, during a reception January 9th before the flight departs at 10 a.m. Passengers will begin to arrive at 7:30 a.m. The event will feature a live reggae band performance and a video presentation. Miss Jamaica, Isabel Dalley, will speak. Passengers will receive a gift from Jamaica and participate in drawings. Coffee and cinnamon buns will be provided. Service to Montego Bay will end in April. Anti-Airport Organizers, Call For Protest Against the Santa Monica Airport, February 4th: "The City Council is fighting back against the Federal Aviation Administration, but they are dazed and confused"
Jet traffic was up 15% in 2016, or about 33% in two years. 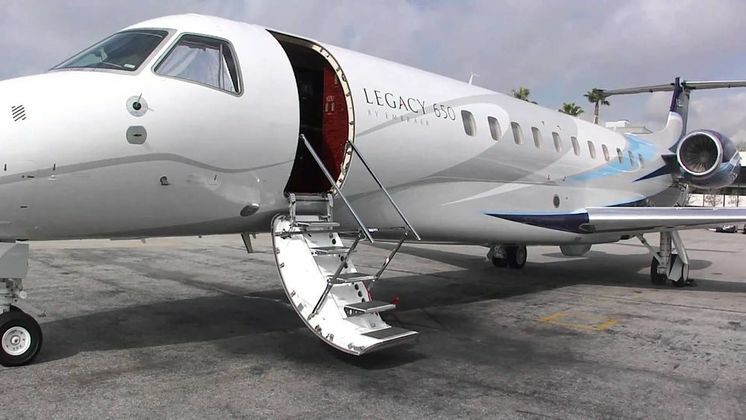 Now, on February 6, JetSuiteX will begin scheduled flights from Santa Monica Airport. 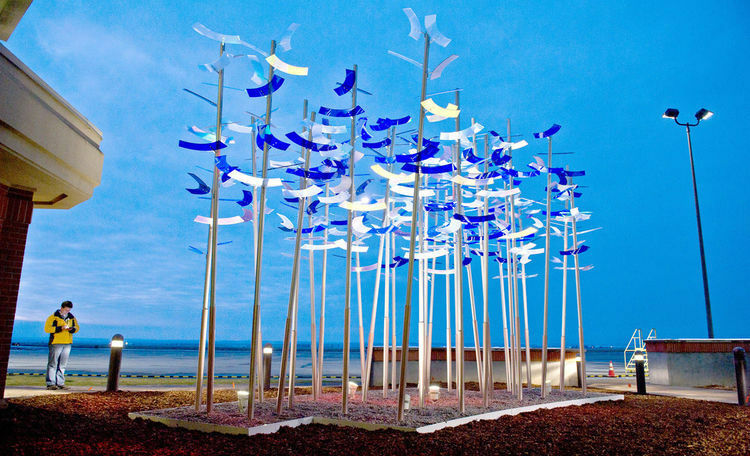 Meanwhile, the City Council set June 30, 2018 to close the Airport, less than 18 months from now, but has taken no steps to implement this symbolic, election-season resolution. The City staff is fighting back, but meekly. The City Council is fighting back, but they are dazed and confused. It's time we fight back with a public protest at the doorstep of Atlantic Aviation, at 2828 Donald Douglas Loop North, Santa Monica, CA 90405. We will protest on Saturday, Feb 4 -- just before the Feb 6 inauguration of JetSuiteX. Sunset Park Anti-Airport has invited No Jets, SMO Future, Friends of Sunset Park, CRAAP, Airport2Park to join our public protests. CRAAP has already "saved the date". We invite City Councilman Mike Bonin, Mayor Ted Winterer, the Santa Monica City Council, and City Manager Rick Cole to speak. There are tons of parking at the SM Business Center a few yards away, we hope to make sure it's free. We will stand in the public right-of-way. Atlantic Aviation was given its Notice to Vacate, not in July 2015, when they explicitly agreed in writing to leave the Airport, but some 15 months later. Our meek city staff and our dazed and confused City Council have not even given a Notice to Vacate to 15 jet owners, who never had any lease with the City, or any legal right to stay at the Airport after July 2015. An unlawful detainer action was begun against Atlantic in November, but the complaint has not even been served on Atlantic yet. No reason, not court actions by Atlantic, just because our meek City staff thought it would look bad. 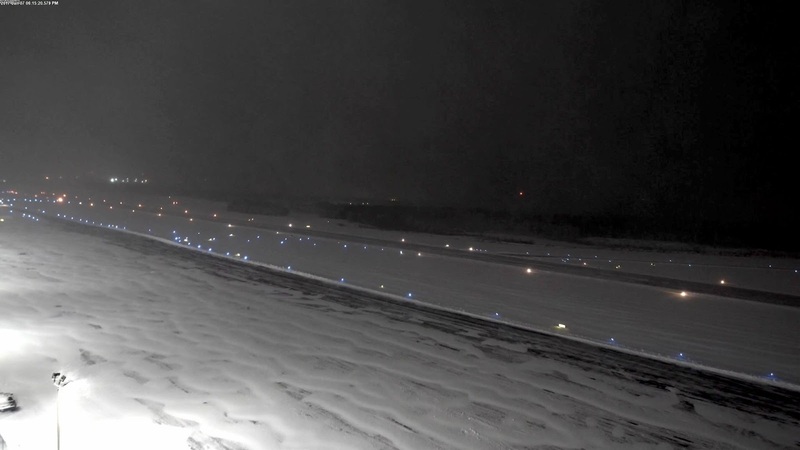 A completely phony and foolhardy legal action by the FAA is 95% certain to fail, but it is enough to freeze the City Council and staff, like deer in the headlights. All this, from professional staff, over 160 of whom earn more than $300k per year. Most will retire on nearly that amount for the rest of their lives. Meanwhile, the Airport is supposed to close in 18 months, but not a single step has been taken since the August 23 resolution. So it is time we step forward, and make sure our voice are heard. Let's put these people on the spot and make sure they hear our demands. Let's give some hell to Atlantic Aviation and the billionaire jet owners (yes, we have jet owners who pay no rent; have no lease; but the City refuses to force their 15 jets out; and yes there are some real-life billionaires among them). Future emails will give more details. You will see why we have timid and overpaid City staff; how our City Council is dazed and confused. We need not be. Show up and give Atlantic Aviation and its clients an earful. Let's let them know what we think of scheduled jet service by JetSuiteX. We will assemble in the public right of way in front of 2828 Donald Douglas Loop N, Santa Monica, CA 90405. See you Saturday, Feb 4, at noon. Tons of parking are a few yards away. RIVERSIDE – A 22-year-old homeless woman and her male partner are under investigation for allegedly burying a newborn who died in their care near Riverside Municipal Airport, authorities said Friday, Jan. 6. The two transients, whose identities were not released, have not been arrested but are at a location where detectives can easily find them, according to Riverside Police Officer Ryan Railsback. He said the police department’s Child Abuse Unit was alerted to the infant’s death Wednesday by Riverside County Child Protective Services, whose case workers interviewed the woman at a hospital, after she had given birth to a second child. The mother admitted delivering her first child at a homeless encampment along the Santa Ana River bottom a year earlier, according to Railsback. She told CPS personnel that the infant was stillborn or died immediately after she delivered it, Railsback said. “The mother claimed she and the father buried the deceased baby … in an open field along the 5800 block of Central Avenue, directly behind Riverside Municipal Airport,” the officer said. With the help of the Riverside Fire Department’s search-and-rescue canine, investigators uncovered the newborn’s remains Thursday night, Railsback said. “Any details as to cause or approximate date of death are pending the coroner’s investigation,” he said. The woman and her partner – the deceased child’s father – were placed in a temporary shelter with the help of the city. The county took custody of the second child. Anyone with information was asked to contact Riverside Police Detective Karla Beler at (951) 353-7125. 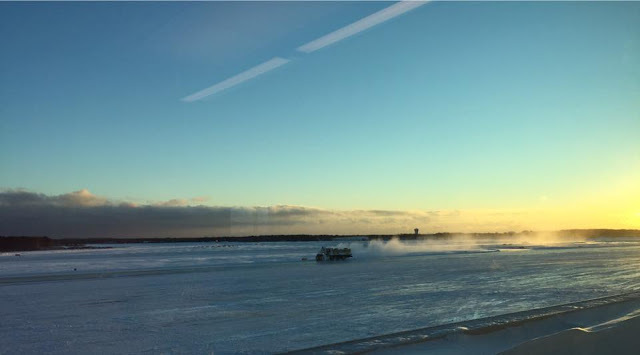 TRAVERSE CITY — The Northwestern Regional Airport Commission is moving ahead with a $10.3 million project to extend Cherry Capital Airport's longest runway. Commissioners at a recent meeting approved $321,412 in contracts with Prein & Newhof for preliminary designs and studies to add 115 feet to the eastern end of the airport's east-west runway, airport Director Kevin Klein said. Once complete the runway will be 7,015 feet long, allowing it to handle fully-loaded passenger planes in the summer heat. Once temperatures hit 86 degrees, the air is thin enough that larger planes need more runway room, Klein said. Airlines have had to leave a few seats empty to compensate, ranging from two for regional jets to 14 for larger planes. That means they're forced to lighten their loads during the region's hottest tourist season. "When you have to do that, of course it affects the airlines' bottom line," he said. The completed project will extend the runway, replace its 24-year-old surface and realign the taxiway to the new east end, Klein said. Federal Aviation Administration funds will cover $6,363,000 of the estimated $10,368,000 budget. Money from passenger facility charges will cover another $3,650,500 — that's where the $4.50 tacked onto each ticket for flights out of TVC goes. The extension also could require some tree removal in a neighborhood east of the runway, Klein said. Preliminary studies show tree removal is needed even without the lengthening. Commissioners approved a $62,356 contract with Mead & Hunt for obstruction removal engineering, which includes trees along with power poles, antennas and other objects. A map shows the neighborhood is bound by Barlow Street to the east, Robinwood Court to the north and Gladewood Lane to the south. Klein said the commission will host a public hearing toward the end of February at the earliest, then work with neighborhood residents on tree removal and obtaining navigational easements. Klein said the airport commission will seek construction bids in the spring once engineering work is complete. He hopes to award bids in the summer, and construction should begin either in September 2017 or spring 2018. The project shouldn't interrupt flights into and out of the airport, as its shorter, north-south runway will remain in service and airlines will adjust their schedules to use the other runway, Klein said. "It's an exciting project," he said. "It'll assist our outreach, especially working with airlines on our outreach to go to communities farther and farther away." HOLLOMAN AIR FORCE BASE, N.M (KFOX14/CBS4) — Officials at Holloman Air Force Base say they will begin routine F-16 night flying operations beginning Sunday up until February 10th. Officials from the Air Force base say local residents and surrounding areas can expect aircraft noise starting in the evening and early morning hours, with aircraft landing as late as 12:30 a.m.
“The purpose of night flying is to familiarize students with the night environment while executing F-16 missions using night vision goggles,” said Maj. Eric Ringelstetter, 54th fighter group instructor pilot. Authorities at the Air Force base say the biggest impact to the community will be the noise made when the aircraft take off. Authorities also say residents in operating areas east and west of Hollomon could experience sonic booms. Air Force base officials say night operations could continue into late February, although that is not anticipated. Officials say they will make every effort to keep the public up to date on any changes to the training times and dates. A hangar used for airplane repairs and maintenance was heavily damaged in a fire Saturday afternoon at the Statesville Regional Airport. The 5,000-square foot building is owned by Rachel and Jones Barnes of Iredell Air Care. 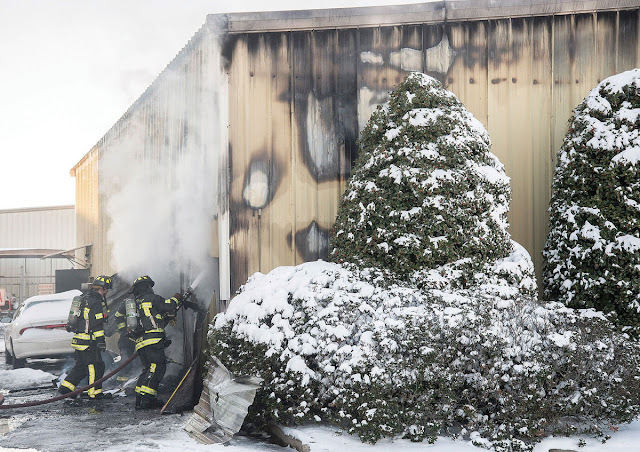 Statesville Fire Chief Gary Styers estimated that nearly $1 million of damage occurred to the building and five planes housed in the hangar. According to Airport Manager John Ferguson, the damage to the planes is primarily heat and smoke damage. All four Statesville stations responded to the fire along with several county volunteer fire departments. The call came in about 4:10 p.m. Saturday afternoon. 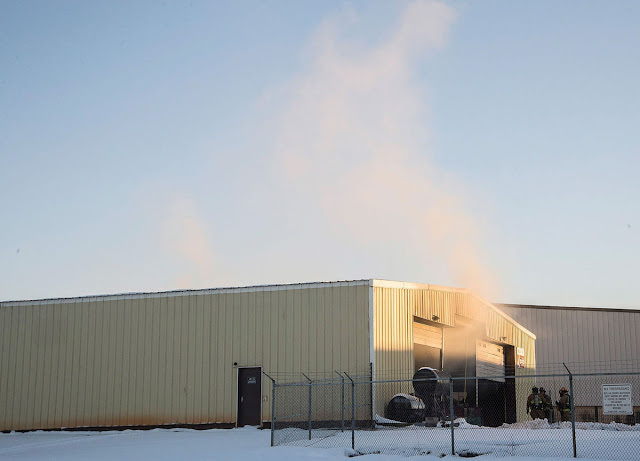 The fire was contained to the hangar, which is located adjacent to the terminal building, about five miles west of downtown Statesville. An investigation of the cause of the fire is underway. The airport is open. "Aviation was fascinating to me from an early age," he said. "I'd build model planes, watch planes in the sky, anything I could do to be around planes." According to the FAA website, the award "recognize[s] individuals who have exhibited professionalism, skill and aviation expertise for at least 50 years while piloting aircraft as 'Master Pilots.'" His name will appear on a "Roll of Honor" on the website, and recipients receive a certificate and lapel pin. 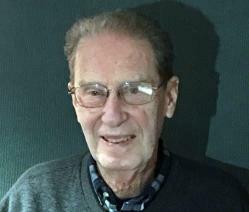 "When I moved down from St. Louis in 1963, I started a business, Advanced Business Systems, here in Cape Girardeau," he said. "I took my pilot's training lessons from Cape Central Airways, and was instructed by David Little. I really valued his training." He said he kept flying through his business career, and when he retired 10 years ago, "I could take more time to fly." "I've never really wanted to be a commercial pilot," he said. "Most of the joy for me is in being up in the air, seeing the beauty of God's creation. It's like being a bird, but just a little bit noisier." He took his family on several short trips, but "mostly I just flew for enjoyment." 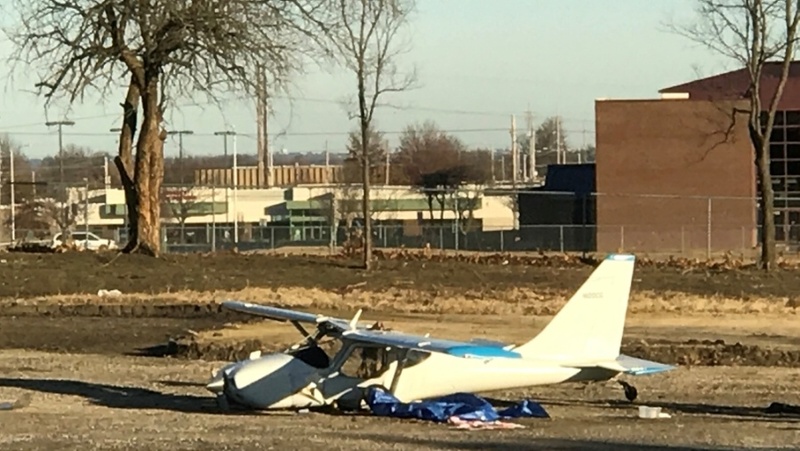 Mehner joined the Cape Girardeau Pilots' Club, an organization that meets every second Tuesday of the month at Cape Girardeau Regional Airport. "I've met a lot of great people that way," he said. "It's enjoyable to fly with other people, to ride sometimes too, and this club helps with that. We like to encourage others to fly, to learn to fly, to get their licenses and keep them renewed. Great organization." 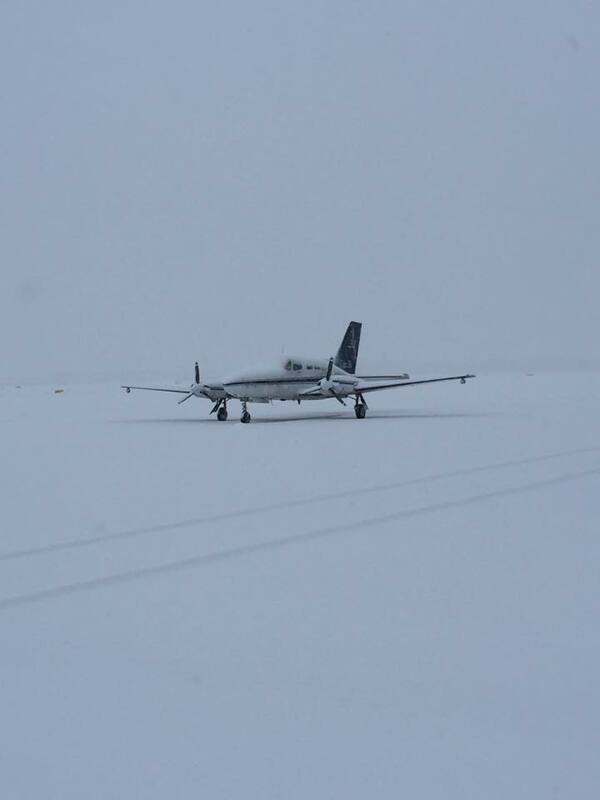 Because Mehner's focus is on shorter trips, he flies smaller planes. "I've flown almost all single-engine planes," he said. "Cessna models, the 150, 172, 182, several Mooney aircraft, Bonanza, Piper Cherokee Six." Lowell Peterson, another member of the Pilots' Club, built a model RV6A plane in his garage, and together, he and Mehner moved it to the airport. "I helped him attach the wings and put the seats in," Mehner said. "So he lets me fly it whenever I want. "We have a great time together. He really did a beautiful job on it." Peterson said, "It's a wonderful thing when you get old enough and you can enter into your second childhood." In the early 1980s, the Pilots' Club would hold air proficiency races. "It was a 300-mile, three-hour course," he said. "Had to estimate how much fuel you were going to use, how much time it'd take you, and you had to beat the manufacturer recommendations for usage. It was a real challenge!" Mehner said. Mehner said he found the formula for the air proficiency race and the requirements in a 1970 issue of Flying Magazine. "We'd love to get that going again," he said. Of his award, Mehner said, "I think it's exciting. It's really appreciated. One of the other club members, Bev Cleair, sponsored me to the FAA, and endorsed me for all those years of flying. That nomination moved through the channels, and they decided to give me the award, for which I'm grateful." Though he has not had any accidents, Mehner's career has not been free of incidents. "When you fly, you have enjoyment and some thrills. I'm really thankful that I've not had any accidents. I had an engine go out once, managed to get it started again. "I've had some ice buildup on the wings, had to land, but found an airport in time. Had some other moments, but all in all, I've been very fortunate. Little planes are really safe. For the most part, if you keep your wits together and fly the plane, you can usually find a place to put it down." Airport Manager Jennifer Skoglund stands near one of the "Illuminated Gateway Arbors" at the Walla Walla Regional Airport. Count 2016 as another landmark year for Walla Walla air travel. In a timeframe when the flight schedule expanded from two daily trips to three most days of the week, the Walla Walla Regional Airport made history once again with a roughly 15 percent jump in passenger traffic. According to numbers from commercial carrier Alaska Airlines released late last week by the Port of Walla Walla, more than 6,000 more people flew in or out of Walla Walla in 2016 than the year before. The numbers continue a three-year record-breaking streak that air travel officials count on to solidify the health of the Walla Walla Regional Airport and ongoing commercial air service. But improvements can still be made, airport Manager Jennifer Skoglund said. Continued communication with the airline on a successful schedule, expanded ridership and increases specifically on Tuesday and Wednesday flights are the focus on the horizon for 2017, Skoglund said. Last month was easily the busiest December on record for passenger numbers. However, it was only the third-busiest month of 2016 when it came to the number of people flying out of the airport, and the fourth-busiest for those flying into Walla Walla. What historically has been the busiest month for air travel each year was affected by the cancellation of five flights. 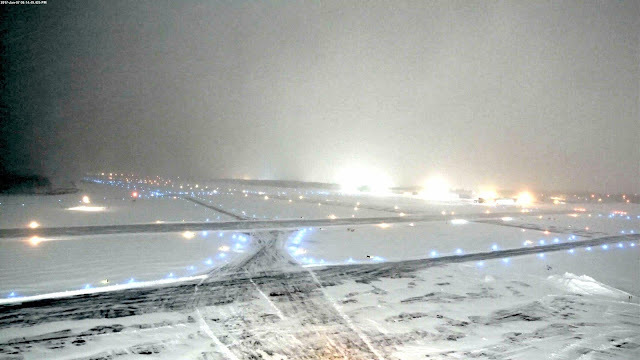 The cancellations were attributed to a combination of factors in an overwhelmingly frigid and snowy month: mechanical issues, the airline not wanting a plane to remain overnight in inclement weather, and crew rest issues with the busy holiday travel season combined with systemwide cancellations and delays. Still, 4,284 people flew out of Walla Walla in December. That’s a 12.7 percent jump from December 2015. The inbound passenger tally for the month was 4,103, a 14.8 percent hike from the corresponding month a year before. The increases are fairly reflective of the overall jump for the year. In all of 2016, 47,422 people flew out of the airport. That’s 6,163 more people than 2015’s record high. Slightly fewer people — 47,123 — flew into the airport for the year. That figure represents 5,846 more people than the number that flew in during 2015. Despite the greater number of individuals taking to the skies, the year-end load factor dropped in 2016. The passenger load factor — the measure of occupancy of available seats — is what the airline scrutinizes as it looks at its profitability in the marketplace. Outbound load factors ended the year at an average of 71.18 percent, while the inbound load factor was 71.9 percent. The percentages are down from 88.21 percent and 84.08 percent, respectively, in 2015. The difference is the addition of the third flight, introduced in March. Throughout the 10 months the third flight operated the schedule had changed at different points. Initially the schedule offered just two flights five days of the week. In June, the schedule changed to bolster the three-flight schedule most days except Saturdays. During November for 16 of the 30 days the airline operated two roundtrip flights per day. Nevertheless, the third flight brought about 16,000 more seats for a roughly 30 percent increase in capacity to fill, Skoglund said. She said expanded marketing — such as the concerted efforts to market and educate locals about utilizing the service and marketing beyond Walla Walla to tourists — will be important in the new year to continue to build traffic and load factors. MORGANTOWN — Interim City Manager Glen Kelly said that while 2016 numbers are still up in the air, the Morgantown Municipal Airport will receive $850,000 in airport improvement funds from 2015 that it failed to capture due to low enplanement totals. An airport with at least 10,000 enplanements in a calendar year receives $1 million in AIP funds while falling below that threshold nets $150,000 from the FAA. Kelly explained that by looking at the airport’s past enplanement numbers, Matt DiGiulian of the FAA determined Morgantown would receive the full $1 million for 2015. “By being able to utilize those numbers and showing that we’ve had good numbers for so many years, he was actually able to give us credit for that. So instead of the $150,000 we got the $1 million,” Kelly said, adding that the 2016 numbers sit at about 9,500, and counting. Additionally, Kelly said the airport’s new carrier, Southern Airways, is working to implement in-line baggage agreements with major carriers like Delta and United, as well as a pre-check security system. Both, he said, could be in place by the end of the first quarter of 2017. 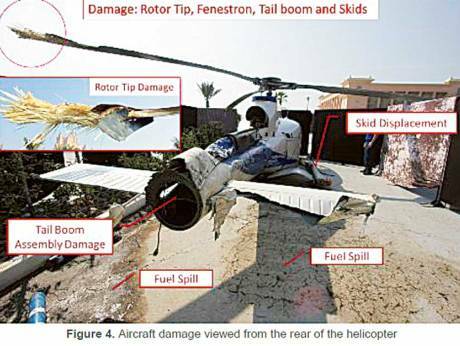 Dubai: A federal accident report into the January 2014 crash of a helicopter shortly after take-off from Atlantis The Palm heliport recommended all light commercial aircraft operating in UAE be equipped with at least one crash-protected flight recorder. Larger aircraft such as long-haul international passenger jets are equipped with black boxes that record all flight activities to help investigators piece together events leading up to major aircraft mishaps. The report suggested that smaller aircraft such as helicopters should also be required to carry such devices. On January 22, 2015, the chopper — identified as an Airbus EC-130 B4 — was taking off with an intended flight to Dubai International Airport when the pilot made an “aerobatic” turn, lost control of the helicopter and crashed on the heliport, according to the report. The pilot and the helicopter-landing officer (HLO) suffered serious injuries, according to the 52-page report issued on December 28, 2016, by the Air Accident Investigation Sector of the General Civil Aviation Authority (GCAA). There were no fatalities. Officials pointed out that the report was compiled to determine findings and causes of accidents, and not to assign blame. The rotational rate of the take-off and turn lead to an “unstable condition developing outside of the pilot’s ability to respond, resulting in a loss of control in-flight (LOC-I) and impact with the heliport,” the report stated. The General Civil Aviation Authority noted in its report the safety actions taken by helicopter operators Helidubai following the accident. Southwest Airlines will open up a new route between Fort Lauderdale and Grand Cayman this summer. The airline announced plans this week to add the island to its growing route schedule. Subject to regulatory approval the flight will be a daily service. Tourism Minister Moses Kirkconnell said the addition of a major new airline, flying from a new hub, would provide another economic boost for the islands’ tourism industry. He said the decision by Southwest followed a two-year “engagement process” involving the Department of Tourism and the Cayman Islands Airports Authority. “Welcoming this award winning airline into our destination will help to bring even more visitors to experience Caymankind and compelling product offerings that differentiate us from our competitors and will support the continued growth of our sector,” he said. The service will begin in June. Mr. Kirkconnell said Southwest’s Rapid Rewards program, regarded as one of the best airline rewards programs in the U.S., would open up Cayman to a whole new customer base. “The opportunity for the Cayman Islands is the strength in Southwest’s brand loyalty program and the new clients that will now consider our destination.” Though tourism officials are looking to expand Cayman’s reach into central and South America, the U.S. remains the main source market for the island, contributing 78 percent of the islands’ visitors in 2016. “Now our guests will have an option out of Fort Lauderdale, Florida, via Southwest Airlines,” Mr. Kirkconnell said. Southwest Airlines, headquartered in Dallas, Texas, announced plans for the route, along with a new service for Cincinatti, Ohio, in a press statement Thursday. Barrie Quappe, left, with ​​Kelly and Jeff McGlashan​​ of Trees4Life. ​The husband and wife team is donating a portion of the proceeds from the sale of imported Christmas trees to the Zak Quappe Flight Scholarship. The Zak Quappe Flight Scholarship has received a $3,000 donation from Trees4Life. 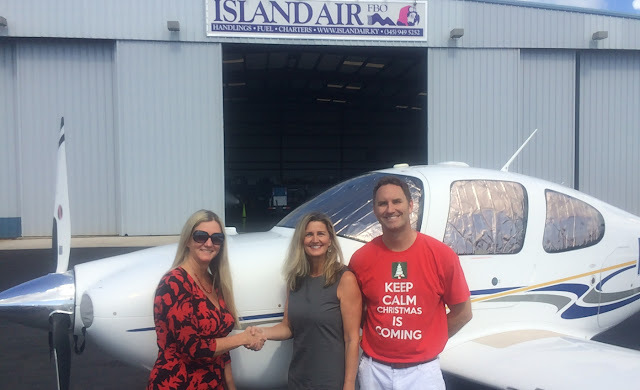 The Trees4Life enterprise was set up by husband and wife team Kelly and Jeff McGlashan, who donated a portion of the proceeds from the sale of imported Christmas trees toward the flight scholarship, which supports young Caymanians seeking to earn a private pilot’s license. The scholarship, awarded annually for between US$12,000 and US$15,000, covers costs such as flight school, training flights and travel expenses to and from the United States. The scholarship was set up by the family of Zak Quappe, a local commercial pilot and flight instructor who died in 2013. For more information on the scholarship program, contact committee members barriequappe@yahoo.com or sebanks@icloud.com. WASHINGTON — According to some reports, America's fifth-generation stealth aircraft doesn't excel at dogfighting. But fortunately, the F-35 Lightning II is not built for dogfighting. While some analysts have argued that the air-to-air-combat capabilities of the F-35A won't match some of its peer aircraft, pilots who spoke to Business Insider pointed out that the US's fifth-generation fighter is designed in such a way that dogfighting may be an afterthought. 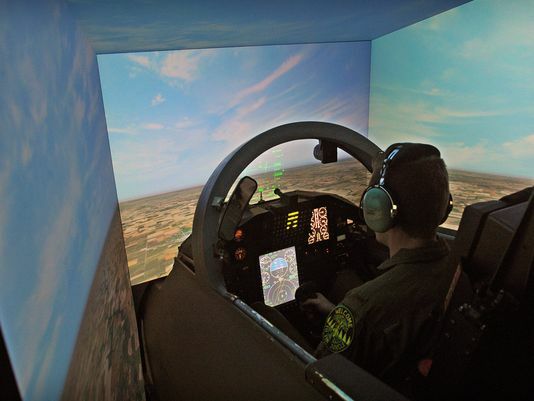 "If you were to engage an F-35 in say, a visual dogfight capability," US Air Force Brig. Gen. Scott Pleus began, "the capabilities of the F-35 are absolutely eye-watering compared to a fourth-generation fighter." "The airplane has unbelievable maneuvering characteristics that make it completely undefeatable in an air-to-air environment," said Pleus, who has 153 flight hours in the F-35A and is the director of the F-35 integration office. "So if it's a long-range contact, you'll never see me and you'll die, and if it's within visual-range contact you'll see me and you're gonna die and you're gonna die very quickly." 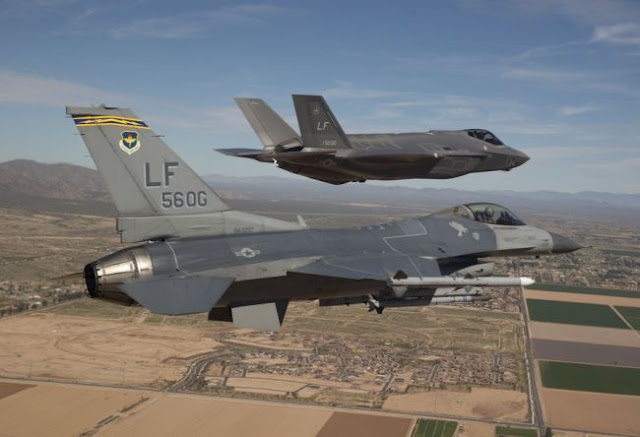 Pleus, a former commander of the 56th Fighter Wing at Luke Air Force Base and a command pilot with just north of 2,200 flight hours, F-35 "is leaps and bounds ahead of anything else in the world today." "The best thing about flying against an F-35, from the F-35 perspective is, you never knew I was there," US Air Force Brig. Gen. Scott Pleus, director of the F-35 integration office, told Business Insider. "You literally would never know I'm there,"
"I flew the F-35 against other fourth-generation platforms and we killed them and they never even saw us." "As a pilot, dogfighting is fun, but it doesn't get the job done," US Air Force Maj. Will "D-Rail" Andreotta, commander of the F-35A Lightning II Heritage Flight Team, told Business Insider. "If I'm dogfighting I'm not bombing my target. I'm not getting my job done, and what I'm probably doing is wasting gas and wasting time." Andreotta, a pilot in the 56th Fighter Wing at Luke Air Force Base who has flown both the F-16 and F-35, says the F-35A's unprecedented situational awareness and stealth gives him "the utmost confidence that this plane will operate perfectly" in a dogfight with fourth-generation aircraft. "I have stealth, so I've fought against F-16s and I've never gotten into a dogfight yet. You can't fight what you can't see, and if F-16s can't see me then I'm never going to get into a dogfight with them." What's more, Andreotta says, the US Air Force's F-16s and F-35s work well together. "The F-16s, F-35s, F-22s, no matter what the aircraft, they all bring something to the fight, they're all different and they all are great compliments to each other. We just all have different capabilities that we can use to get the job done." "The F-16s and fourth generation are really benefitting from all the information we are able to pull in and send to them," Andreotta said. "I can take information that I'm getting from the F-35 and push it out to other aircraft that don't have the capabilities that I have. That's huge. I would have killed for that when I was flying an F-16." "I think if you talk to any fourth-generation pilot that has flown with the F-35 they'll rave about the information they're getting from us, and we're not even at the point where we are sending out all the information." Lee’s Summit resident Tim Pickering stepped forward to express concerns over the volume of air traffic coming and going from the Lee’s Summit Airport. He reported an increase in air traffic flying directly over his home located at 1025 NE Woodbury Lane since his purchase of the home in 2009. “The amount of aircraft flying over my home has increased significantly,” he told the council. Pickering explained that he understands air traffic has increased since the 1500-foot expansion to the runway and includes small jets and other aircraft. But, he explained, he lost the peace and tranquility he came to Lee’s Summit for. He explained that his significant other is no longer comfortable laying out at the pool at the home due to the number of aircraft flying overhead. Pickering said he understood the Council was limited on their ability to do anything about it, but he didn’t fully accept that. The Council had no comments. HYANNIS – Barnstable Municipal Airport has reopened after it was shut down by the first major storm to hit Cape Cod this winter. 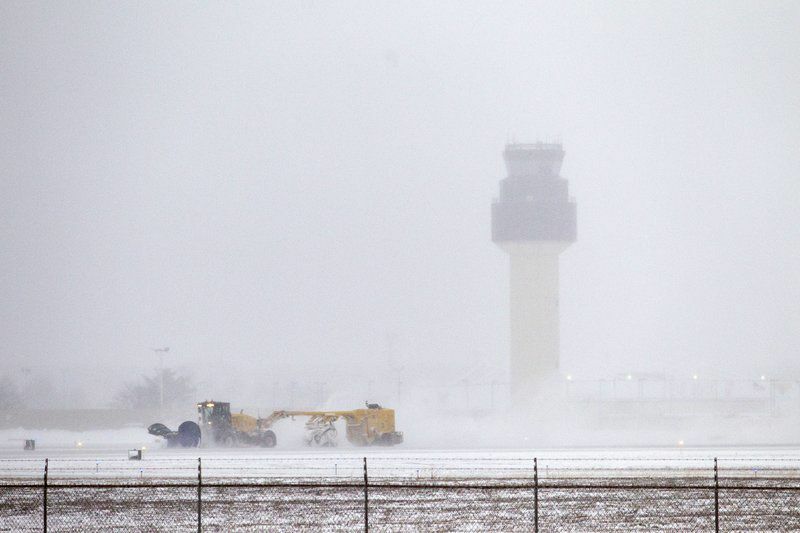 The airport reopened for operations at noon – 24 hours after closing. 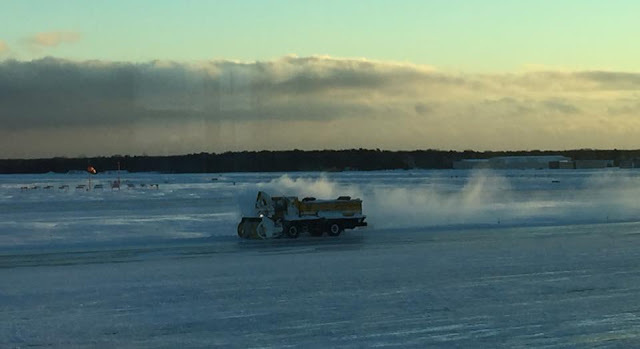 Airport work crews worked through the night and the morning to get the runway ready for service. Rectrix Aviation flights have been canceled for the day. 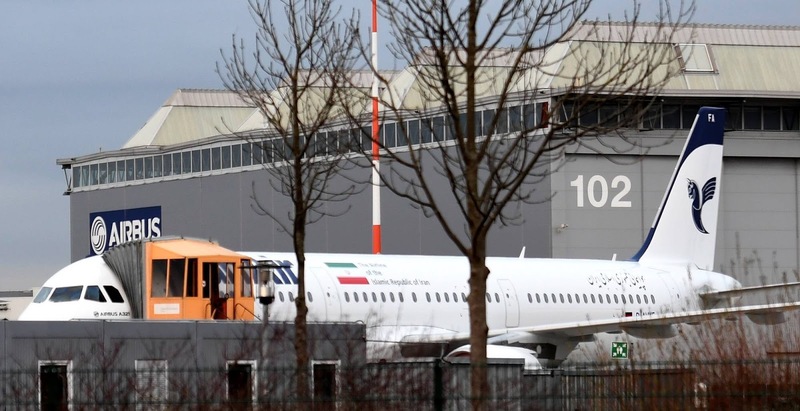 Iran has taken ownership of its first new Airbus SE jetliner since sanctions were lifted on the country last year, allowing it to revamp an aging airline fleet through controversial plane deals also involving Boeing Co. The European plane-maker Sunday said “technical acceptance” of the first plane to Iran’s flagship state-owned carrier, Iran Air, has been completed, effectively marking the transfer of ownership of the aircraft. A formal handover event will take place at a later date. Iran Air Chief Executive Farhad Parvaresh said the plane’s pilot and co-pilot were in France waiting to fly it to Iran later this week, according to the official Islamic Republic News Agency. The airline plans to use the plane for domestic flights, he said. Iran Air late last year finalized deals to buy 100 planes from Airbus and another 80 from Boeing, the world’s largest maker of jetliners. The orders are worth more than $34.5 billion at list price, though buyers typically get deep discounts. Iran is in dire need of modern jets. Its commercial air fleet has became one of the world’s oldest and least safe, under sanctions that have spanned decades and made obtaining aircraft and parts difficult. The plane deals are the highest-profile commercial agreements between Western firms and Iran since the completion of a 2015 nuclear pact between the world powers, including the U.S., and Tehran. In exchange for Iran putting curbs on its nuclear program, the powers agreed to lift many sanctions on the Islamic Republic. Critics of the nuclear pact in the U.S. have tried to block the aircraft sales from proceeding, introducing measures in Congress to bar financing the purchases. Those efforts so far have failed to stop the deals. The U.S. government last year granted Boeing and Airbus, the world’s No. 2 plane maker, the required licenses to sell the planes from the U.S. Office of Foreign Assets Control, an arm of the Treasury Department. The election of Donald Trump, a critic of the Iran nuclear deal during his presidential campaign, could introduce a new note of uncertainty. The president-elect hasn’t said whether he will try to undo the deals after he takes office on Jan. 20. The plane purchases are seen by some as a litmus test for how the Trump administration will handle business dealings with Iran. German conglomerate Siemens AG, French oil giant Total SA, French telecommunications firm Orange SA and British telecom giant Vodafone Group PLC are among the other big Western companies pursuing their own deals, with varying degrees of investment commitments. Iranian officials have said that if the U.S. government were to halt the plane deals, they would demand repayments plus interest. “Both sides are committed, and there are scenarios in the contracts for violation of commitments or in case of force majeure to deal with those cases,” Mr. Parvaresh said in December. He said Airbus would deliver seven or eight planes this year. Any future U.S. action to block plane sales to Iran would likely affect only pending deliveries, not planes already transferred to Iran Air. While Iran signed its deal with Boeing before the Airbus pact, deliveries from the U.S. plane maker aren’t set to start until 2018. That leaves more time for politicians who oppose the deal to block the transfer of those jets, even as Airbus sales move forward. 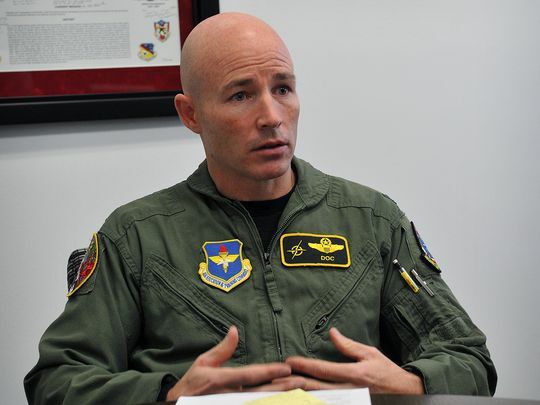 Col. Gregory Miller, Deputy Group Commander for the 80th Flying Training Wing, talks about the efforts to increase the number of pilots training at Sheppard Air Force Base to help address a pilot shortage Air Force-wide. Air Force combat pilots are accustomed to taking to the skies and fending off foes who threaten not only them, but the United States. But there are new foes, so to speak, that challenge the most talented of combat jet fighter pilots.The Air Force isn’t necessarily powerless against them, but find it a challenge to keep the ranks of their wartime aviators strapped into fourth- and fifth-generation jets. It’s a confrontation the Air Force is taking on head first to make sure the dedicated aerial fighting force continues to place soar to regions at a moment’s notice to protect the United States, its allies and its interests. Air Force Chief of Staff Gen. David Goldfein said time and again in August the service is facing a fighter pilot crisis. Growing that talent begins at places like Sheppard Air Force Base, which in and of itself has its own set of unique circumstances. 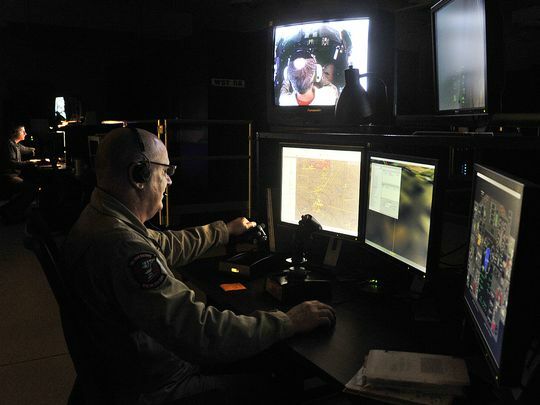 As with the technical training side of the base’s house, the 80th Flying Training Wing, too, has seen a reduction in the number of airmen coming through for pilot training. 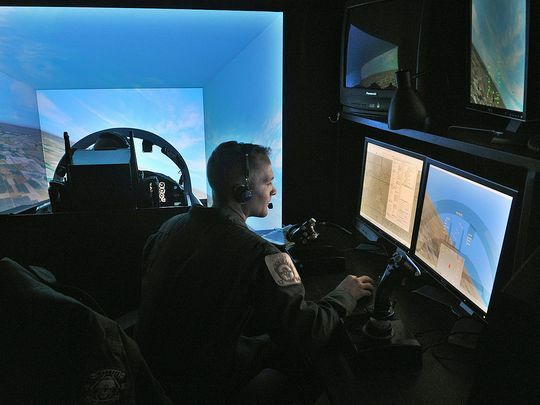 But the participation of NATO partners in the Euro-NATO Joint Jet Pilot Training program – the only internationally manned and operated training unit of its kind – presents challenges that other pilot training programs at Vance, Laughlin and Columbus Air Force bases don’t face. Miller said the Air Force is about 700 fighter pilots short of what it needs to adequately perform its missions, and that figure could rise to 1,000. The two primary reasons for the shortage are opportunities in the civilian sector for the highly-trained aviators, and morale issues that stem from the service being at war since the early 1990s and the First Gulf War. The Air Force has had a presence in the region since that time as fighters patrolled no-fly zones in northern and southern Iraq. Miller said there is nothing the Air Force can do about an airline industry that also faces a pilot shortage as many senior pilots near the mandatory age of retirement, but the service has increased the numbers of pilots it will train as well as its annual flying bonus from $25,000 to $35,000. That has affected the number of pilots going through Sheppard’s training program. According to figures provided by Sheppard, 218 students graduated from the program in FY 2016. More than 300 will graduate by the end of the current fiscal year. Part of that is because of the number of students beginning and ending their training at Sheppard, but the other part is students from Vance, Laughlin and Columbus transferring to Sheppard before their advanced training in the T-38C Talon to complete their training here. Pilots attending the 80th’s Introduction to Fighter Fundamentals course has increased 45 percent this year. An ever-moving variable in the equation, the colonel said, is the number of students NATO partners send over. He said the committee that oversees the training program works throughout the year to ensure ENJJPT and each partner country is getting the most out of the program, but the numbers can fluctuate. Miller said although the training tempo might have increased within the past year, safety will always remain the priority over timelines and graduation dates.